On January 31, 1843, Isaiah W.P. Lewis, then 35 years old, submitted a report to Congress on the condition of lighthouses in New England. A respected civil engineer and former master mariner born in Charlestown, Massachusetts, Lewis had been appointed to this task some eight months earlier. In that time he inspected 70 lighthouses and surveyed many dangerous shoals in need of a beacon. Lewis’s report was scathing. He criticized the administration of Stephen Pleasonton (1775-1855) who had been Superintendent of the Lighthouse Establishment for the past 23 years. Pleasonton, back during the War of 1812 when he was a clerk with the State Department, had done our nation an enormous service by rescuing the Declaration of Independence, the Constitution and many other precious documents just before the British burned Washington. But he had done a great disservice by allowing the Lighthouse Establishment to fall into lethargy. The Establishment had failed to maintain facilities and made little effort to build new beacons or take advantage of new technology. Pleasonton was shamed into action. A Boston newspaper noted that Lewis’s, “temerity in exposing the actual condition of things” brought about immediate repairs and widespread replacement of lamps. One of Lewis’s recommendations addressed the terrible dangers of Minot’s Ledge just off the coast of Cohasset, Massachusetts near Boston Harbor. Ships had been going aground on the many large rocks in that vicinity for centuries–40 vessels between 1832 and 1841 alone. A report submitted in 1847 by Capt. Daniel Lothrop indicated that 40 lives had been lost there between 1817 and 1847. Lewis recommended that a light be placed on the ledge immediately. His recommendation was supported by Capt. William H. Swift of the U.S. Topographical Bureau. Lewis and Swift consulted together on the design for the first Minot’s Light. The extreme challenge lay in the fact that the light would have to be placed a mile offshore on a ledge that was only exposed for a few hours at low tide. Most of the time, the base of the lighthouse would be submerged and would need to withstand incredible pressure from wind and waves. 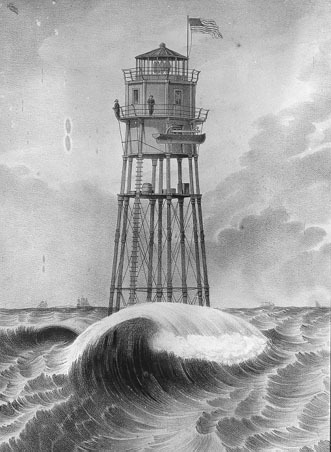 Swift favored a design involving iron pilings, essentially placing the lighthouse on stilts. This would, in theory, offer less resistance to the tide than a solid, stone tower. The latter, Lewis and Swift concluded, would be too easily toppled. And so work began in 1847. It was an arduous process drilling the holes for the pilings. The platform set up for drilling was wrecked twice by storms in the summer of 1847 but no one was hurt during construction. With the holes drilled, work moved more quickly. Just three months before completion, in October 1849, the Brig St. John, a famine ship carrying Irish immigrants, ran aground and was broken up on the rocks near Minot’s Ledge. 99 men, women and children drowned. It was the worst shipwreck ever to take place on the Cohasset rocks. For those working on Minot’s Light, the tragedy must have added a new sense of urgency. Might it have been avoided if the light had been finished just a few months earlier? The light was first lit on January 1, 1850. It was praised as a marvel of construction and was a great reassurance to New England mariners. But the first lightkeeper, Isaac Dunham, did not feel at all confident about the structure. Noting that it swayed severely during storms, he wrote the Lighthouse Establishment in Washington, asking them to shore up the pilings. When no action was taken, he resigned on October 7, 1850. Here was the new iron light-house, then unfinished, in the shape of an egg-shell painted red, and placed high on iron pillars…A man was to live in that egg-shell day and night, a mile from the shore. When I passed it the next summer it was finished and two men lived in it, and a light-house keeper said that they told him that in a recent gale it had rocked so as to shake the plates off the table. Think of making your bed thus in the crest of a breaker! To have the waves, like a pack of hungry wolves, eying you always, night and day, and from time to time making a spring at you, almost sure to have you at last. The second keeper was Capt. John W. Bennett who brought on two assistant keepers, an Englishman named Joseph Wilson and a Portuguese man named Joseph Antoine. Bennett initially scoffed at his predecessor’s timidity. But it was not long before Bennett himself came to the conclusion that the structure was unsafe and repeatedly wrote to officials requesting that it be strengthened. The keepers frequently had to remove bent iron braces between the pilings and bring them to shore to have them straightened. On April 11, Capt. Bennett departed the lighthouse to visit the Customs House in Boston to arrange for the purchase of a new dory. He left the light in the charge of his two assistant keepers. The next day, he returned to Cohasset intending to get back to Minot’s Light. But an easterly gale had developed and the sea was extremely heavy. Venturing by boat out to the lighthouse was impossible. Inside the battered lighthouse, keepers Wilson and Antoine kept the light burning and the bells sounding into the night of April 16. Residents on the shore of Cohasset recalled seeing the light as late as 10 p.m. It is believed that, around 11 p.m., the central support piling snapped and the lighthouse began to list, held up only by a few of the smaller outer pilings. Somewhat before 1 a.m. on April 17, 1851, these gave way. Residents claimed to have heard the lighthouse bell ringing violently about this time, perhaps an attempt by the keepers to communicate their terrible distress. No one could see the lighthouse as it toppled in the waves. Joseph Antoine’s body washed up on Nantasket Beach that morning. Joseph Wilson’s body was found on tiny Gull Island, just about 300 yards from the mainland of Cohasset. It is believed he managed to swim to the island but died of exposure. Capt. William Swift, who had been the primary designer of the structure, visited the site on April 22, inspected it thoroughly and made sketches of the broken pilings. Defending his design, he argued that much damage had been done by a hawser which keeper Bennett had apparently fastened to the lantern deck. The keepers used it for running boxes or a landing chair up and down–something like what we might call a zip-line now. The lower end was tied to a huge granite block resting underwater. With the surf pushing this block, it would actually have the effect of pulling on the lighthouse near its highest point–almost as though designed to pull it down. While this may have contributed, clearly the structure failed in a great many ways. 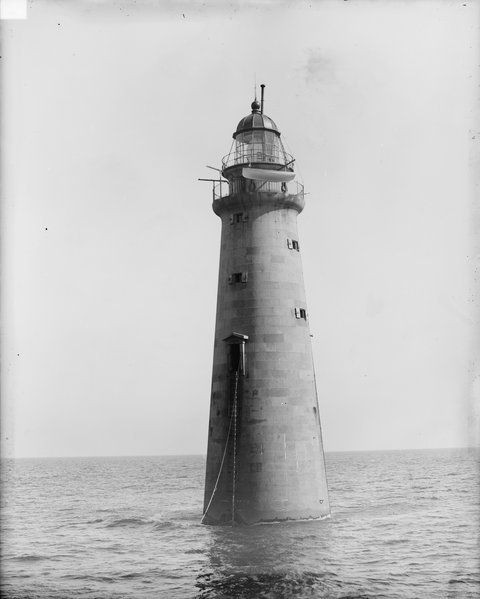 The second Minot’s Ledge Light c. 1890. Library of Congress photo. The lighthouse on Minot’s Ledge was rebuilt, this time as a granite tower standing 114 feet tall. It was first lit on November 15, 1860 and still stands today. As is the case with many dramatic stories of this sort, ghost stories almost inevitably crop up around them. 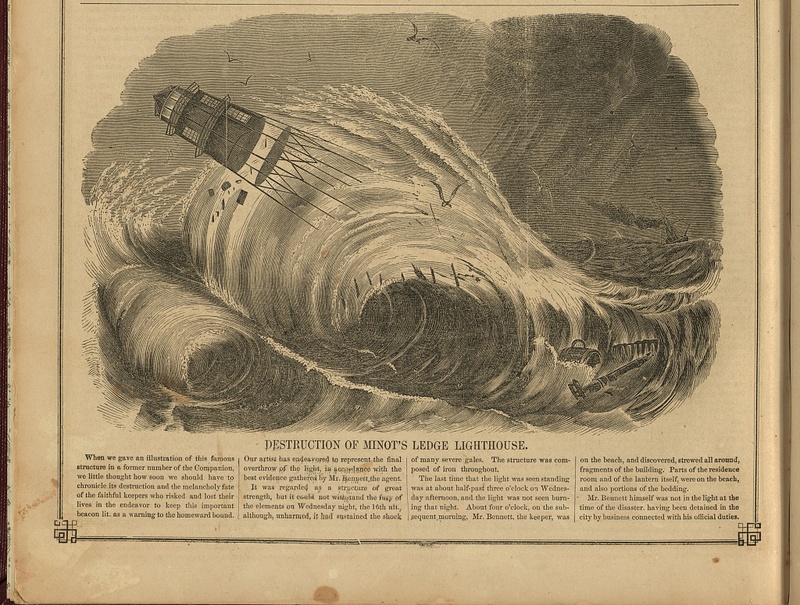 In fact, the first time I heard of the destruction of the Minot’s Ledge Light, it was related to me in the context of a ghost story many years ago. Keepers of the new light, so the stories go, believed it was haunted by Wilson and Antoine. There were mysterious groans, pounding, even signs of the lenses having been recently polished when the earthly keepers went to do so. Allegedly, a crew of Portuguese fishermen passing the lighthouse saw a man on the outer ladder calling to them, telling them in Portuguese to stay away. And there are tales of Gull Island being haunted by Wilson. I have an interest in tracking down the origins of New England folklore (as returning readers will know) and I can say with some confidence that the first published source telling of ghosts at Minot’s Light was Edward Rowe Snow’s 1940, The Story of Minot’s Light. This does not come as a surprise. I’ve traced more than a few persistent New England legends back to Snow–his story of “The Lady in Black” at Boston’s Fort Warren being perhaps the most notorious for fabricated (yet widely accepted) history. This sort of thing is troubling to say the least. And yet, a good deal of valid and valuable New England oral history would likely be lost to oblivion if not for Snow’s works. In short, I have mixed feelings about Mr. Snow. This entry was posted on Friday, October 30th, 2015 at 5:34 pm	and tagged with Cohasset Massachusetts, Isaiah W.P. Lewis, Minot's Ledge Lighthouse, William H. Swift and posted in Folklore, Maritime history. You can follow any responses to this entry through the RSS 2.0 feed. Patrick: Thank you for this and all your other most enjoyable and interesting Historical Digression articles. I am the editor of the Dunham-Singletary Family Connections quarterly newsletter. You very kindly gave us permission to use one of your earlier articles which related to a Dunham in our newsletter. I would like your permission to use the article The Tragic Story of Minot’s Ledge Lighthouse in our 15 January, 2016 issue. The Isaac Dunham who was the keeper of the Minot Ledge Lighthouse, mentioned in your article, was Isaac-7 Dunham (Cornelius-6, Cornelius-5, Israel-4, Eleazer-3, Joseph-2, John-1 Dunham). This Isaac was born 4 Sept. 1789 in Plymouth; d. 25 March 1856 in North Bridgewater, MA. The 1850 census shows him together with his 24 year old son (also named Isaac) at the Minot Rock Lighthouse. This Isaac Dunham had been the keeper of the light at Pemaquid Point, Lincoln Co. Maine prior to moving back to Massachusetts. I would like to write an article about the above Dunham family for the 15 January, 2016 newsletter. Thanks for the information. I’d be happy to have you reprint the article. I’ll e-mail you shortly with a little more information. I have a much loved oil painting of Minot’s Light and would love to know the name of the artist. Initials on lower right corner are EWK or EHK. The E and K are clear. Thank you for any information you may have. It has been in my family for at least 40 years.